Congratulations to "Joyce M.", the winner in Debra's giveaway. Thank you to all who participated! The Faces of Evil is one of my favorite series. I’ve written more than 130 books and somehow Jess Harris Burnett and her major crimes team just stole my heart. Even after the series was finished it seemed, I simply couldn’t put those characters behind me. I wanted more Jess and Dan!!! So I teamed up with Harlequin Intrigue to put a new spin on the Faces of Evil. I hope you’ll grab a copy of ENVY, the prequel for the new Faces of Evil. It’s a short story and free at most ebook sellers! ENVY bridges the move from the old Faces of Evil to the new for readers who’ve followed Jess’s journey from the beginning. But don’t worry, even if you haven’t read the others you’ll love Jess and the team beginning with DARK WHISPERS. Each one will be a standalone novel you can find wherever books and ebooks are sold. DARK WHISPERS gives Lieutenant Clint Hayes his own story. Clint is as handsome as sin and a damned good cop who now works with Jess at her private investigations firm. Clint is charged with solving the strange happenings in Natalie Drummond’s life, starting with a missing body! Natalie has suffered a traumatic brain injury and her life is just settling back down. She needs help desperately. Clint is just the man for the job. She needs his steady hand and his keen insight. What she finds is the love she has always yearned for. I’m certain you’ll enjoy the journey with these two characters. I surely loved writing their story. Be on the lookout for STILL WATERS, the next book in the Faces of Evil series, coming in October! To win a digital copy of ENVY and DARK WHISPERS, respond to this question in the comments section below: I’d love to hear how you overcame an injury or loss while you’re visiting JRS today! 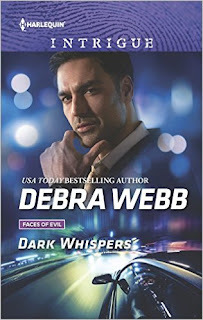 About the author: DEBRA WEBB is the USA Today bestselling author of more than 100 novels, including reader favorites the Faces of Evil and the Colby Agency series. She is the recipient of the prestigious Romantic Times Career Achievement Award for Romantic Suspense as well as numerous Reviewers Choice Awards. In 2012 Debra was honored as the first recipient of the esteemed L. A. Banks Warrior Woman Award for her courage, strength, and grace in the face of adversity. Recently Debra was awarded the distinguished Centennial Award for having achieved publication of her 100th novel. With this award Debra joined the ranks of a handful of authors like Nora Roberts and Carole Mortimer. With more than four million books in print in numerous languages and countries, Debra’s love of storytelling goes back to her childhood when her mother bought her an old typewriter in a tag sale. Born in in Alabama, Debra grew up on a farm. She spent every available hour exploring the world around her and creating her stories. She wrote her first story at age nine and her first romance at thirteen. It wasn’t until she spent three years working for the Commanding General of the US Army in Berlin behind the Iron Curtain and a five-year stint in NASA’s Shuttle Program that she realized her true calling. A collision course between suspense and romance was set. Since then she has expanded her work into some of the darkest places the human psyche dares to go. About Dark Whispers: Former homicide detective Clint Hayes has his first client as a private investigator: a fragile beauty he isn't sure he can trust. An injury has left Natalie Drummond with gaps in her memory, and she sees and hears things that aren't there. But she's sure she shot an intruder in her Birmingham mansion. So where's the body, the gun, the evidence? When it's clear someone is trying to kill his vulnerable client, Clint appoints himself her protector, working overtime not to fall for her. But someone is dead set that Natalie never regains her memories—or makes new ones with Clint. Enter for more opportunities to win on the JRS SHOWCASE! I have been blessed to not have experienced a severe injury and my biggest loss to date was when my mom passed away. However, I know that I will see her again and that helps to ease the feeling of loss. Thank you for sharing, Joan! Great to meet you! I guess you could say that I am still overcoming a loss. Fourteen ago, I became ill with a couple of chronic illnesses. They changed my life dramatically. Obviously, I had to learn with the illnesses that involved pain and fatigue. It also shook up my life. I had to give up my dream career and suffered financially from medical bills. I stumble along the way in my new journey and have had to rely heavily on my faith in God. I guess the most important thing I do is after one or several bad days, I don't give up. I pick myself up and keep trying. Great to see you here, Kenra! Thank you so much for sharing! I have read many of Debra's books and love each of them. I hope to ream many, many more! Thank you so much, JoAnn! I have not had any severe injuries but have broken a bone or two. Physical therapy is the best! I am looking forward to reading this book, some of my favorite tropes (memory loss, mystery). Happy reading! Thank you, Pam! The research was extremely interesting! Many years ago, I was in a terrible car crash. While my physical injuries were minor, emotionally I was a wreck for the next four years. I was finally able to claw my way back and fight through that fear that had such a tight grip on me. Of course, the help of some really good friends helped make the difference. Jonetta, isn't that the truth! Good friends make all the difference! Thank you for sharing! I developed RA (rheumatoid arthritis) after my second child. Taking care of a newborn and a 3 y/o while struggling with RA was a definite challenge. jasm1809 at gmail dot com. Joyce, hugs to you! I have a friend who had the same thing happen. Thank you for sharing! Hey Deb. I deal with chronic illness and loss by taking things one day at a time and always remembering that there are many other people out there who have many more problems than I do! I already have the e-books so, don't put me in this giveaway. Cindy, thank you for sharing. This is very true. I remind myself of this often! The loss of my grandmother still hits me... it has been around 10 years, but at times I still feel like there is a hole in my life and my heart... other times I can say that memories of times with her do bring smiles to my face. Colleen, I still experience that overwhelming sense of loss about my parents. It was so hard to say goodbye. Thank you for sharing! I think we all have emotional and physical problems that we have to deal with frequently. Reading is a great way to escape from both. Deb always manages to make me feel better no matter how I'm feeling! Don't miss the new Faces books. It's wonderful to enjoy the books while visiting with old friends! Thank you so much, Marijane. I totally agree. Reading can take you away! We unfortunately suffer loss many times in life ... loss of my Mom was an extremely hard one to heal from ... loss of pets always hits us hard ... sometimes loss of a friend or a relationship. Through it all, I find that letting yourself feel everything you need to feel and get all of your mourning out helps the most. You never stop missing what you have lost, but you eventually get to a point where you can remember fondly with a smile on your face as you keep that person in your heart always. Lynn, thank you! Yes, I know exactly what you mean. After my oldest was born I couldn't tell the story of what she suffered as a newborn and continues to suffer without crying. Now, with the passage of time and with watching her grow into an amazing woman who lets nothing stop her, I can tell her story with great pride and much joy! The best way I deal with my out of control eye issues or my pain management of mystenosis of the spine is being an eternal optimist and knowing someone has bigger problems than I do. So I look for a good book to take me on an adventure. Thank you, John. You truly are an eternal optimist! Keeping that attitude is so important! Brenda, thank you for sharing. The support of family and friends is priceless! Hey Deb!!! Just dropping in to say hi!! Love you and your books!! You are one of a kind!! DeeAnn, thank you! I am blessed to have so many wonderful friends! My father died a few years ago. Having family support was most important. Definitely! Thanks for sharing, Mary! Hugs, Jan. I can't imagine. Thank you so much for sharing. My roommate had a stroke and has memory issues can be very frustrating for him and for people who had conversations with him that he doesn't remember. The way you describe this issue in your book was so accurate and compassionate, Debra. Five star writing for sure. Thank you so much, Melody-Rose! Thank you for sharing! Yay I have all of them I cannot wait to get this one as well!!! I love the Faces of Evil series!!! Sometimes the loss of someone you cared deeply for hits you at the most inopportune moments. I still pick up the phone to call my grandmother anytime that I have exciting news and it always catches me after I dial the number. Its been 10 years this year and it never fails. On to happy notes. I love your books!!!! Thank you, Cortney! The sadness related to the loss of a love one lingers a lifetime, only the degree of sadness changes. lost my husband and granny within 3 months of each other. still hurts. Hugs, blackroze37. Thank you for sharing! Congratulations on another winner Debra!